When we say 'mobile' we don't mean mobile just as when we said 'PCs' we didn't mean PC. This isn't about the screen size or keyboard or location or use. Rather, the ecosystem of ARM, iOS and Android, with 10x the scale of Wintel, will become the new centre of gravity throughout computing. The future of personal computing is mobile, and Microsoft has lost mobile. That means the end of Windows Everywhere, and undermines Office too. Now that Microsoft's admitted this, what does it do next? This is a still from the classic film 1960 'The Apartment'. Jack Lemmon plays CC Baxter, a clerk in a large insurance company in New York, and so here you see his office - drones laid out at desks almost as far at the eye can see. Each desk has a telephone, rolodex, typewriter and a large electro-mechanical calculating machine. In some of the other shots you can see the manufacturer - 'Friden'. When people talk about productivity - about PowerPoint and Excel and how Google Docs and the cloud will or won't kill them, or messaging and the cloud, or how you need a PC for 'real work' - I'm reminded of CC Baxter and his Friden calculating machine. What killed those machines was not better, cheaper competitors but a completely different way to address the same underlying business need. Instead of hundreds of people recalculating insurance rates, the company bought a mainframe. The business need was being met, but the mechanism changed completely and the old tools disappeared. That is, the way forward for productivity is probably not to take software applications and document models that were conceived and built in a non-networked age and put them into the cloud, or to make carbon copies of them as web apps. This is no different to using your PC to do the same things you used your typewriter for. And of course that is exactly how a lot of people used their PCs - to start with. Just as today we make web app copies of software models conceived for the floppy disk, so the first PCs were often used to type up memos that were then printed out and sent though internal mail. It took time for email to replace internal mail and even longer for people to stop emailing Word files as attachments. Equally, we went from typing expense forms (with carbon copies) to entering them into a Word doc version of the form, to a dedicated Windows app that looked just like the form, to a web page that looked just like the form - and then, suddenly, someone worked out that maybe you should just take a photo of the receipt. It takes time, but sooner or later we stop replicating the old methods with the new tools and find new methods to fit the new tools. Hence, channeling Marshall McLuhan, new tools start out being made to fit the existing workflows, but over time the workflows change to fit the tools. Some times and only sometimes, it's possible to see the new model springing into existence, like Athena fully formed. This 1979 preview of VisiCalc, the first spreadsheet software, captures just that. The writer has to explain, slowly, what the concept we call a spreadsheet is (the term itself is never used), and what it might be good for, because for most people there was no paper analogue. Yet, very early, it became clear that though spreadsheets are indeed 'magic paper', they're often, indeed perhaps mostly, used for things that aren't actually calculations. As Joel Sposky pointed out here, Excel is a great way to make tables. It's also both the world's most widely deployed IDE and the world's most widely deployed desk-top publishing program. In Japan people used it instead of Word to write letters (for the layout control). I spoke on Twitter a while ago to a consultant who told me that half his jobs were telling people using Excel to switch to a database and the other half were telling people using a database to switch to Excel. The tools fit the workflow, and then the workflow fits the tools. I'd suggest that Microsoft Office is actually somewhat unusual in the field of productivity apps in how broad its use ended up being. Most normal people don't use Photoshop just to crop their holiday pictures or AutoCAD to sketch out where to put a new sofa, but Office encompasses both people who are using it for what it's designed and optimised for, and people using it because it's there, since it's so widely and cheaply distributed (perhaps 1bn copies are in use today in one way or another) and so broad and flexible. (One could debate this, of course - using Photoshop to generate web layouts is arguably as 'abusive' as using Excel as a database.) So there are people using Excel to build complex financial models and people using it to manage timetables, people using Word to create complex structured documents and people using it to write memos, and people using Powerpoint to communicate complex data to wide audiences and people using it for internal metrics reporting. For decades, this has prompted the idea that if most people don't need most of the features, a competitor, with fewer features but cheaper or with different routes to market, can peel away more and more of the users, leaving behind only the very core power users. This never really happened, and it seems to me that this may be the wrong way to think about the issue. The power users need those features because it is their job to make complex financial models, sophisticated presentations or structured documents and so on, and those features help them do that. But the reason that all the other users can sometimes do without all the features is not because their job is to make simpler, more basic documents - rather, their job is not actually to make presentations or models at all. They're in sales or marketing or logistics or dozens of other roles and they're using these tools because that's what they have, but that's not their job - it's just a tool. So these people should not be using a simpler cheaper alternative to Powerpoint or Excel (or indeed Photoshop), or one with a few different features. Rather, the way they change tools is if you give them fundamentally different ways to achieve the underlying task. Hence today, in a thousand companies, a thousand execs will pull data from internal systems into Excel, make charts, put the charts into PowerPoint, write some bullets and email the PowerPoint to a dozen other people. What kills that task is not better or cheaper (or worse and free) spreadsheet or presentation software, but a completely different way to address the same underlying need - a different mechanism. That Powerpoint file could be replaced by a web app for making slides that lets two people work on it at once. But it should be replaced by a SaaS dashboard with realtime data, alerts for unexpected changes and a chat channel or Slack integration (Slack is an a16z investment). PowerPoint gets killed by things that aren't presentations at all. The business need is met, but the mechanism changes. You can see some of these use cases in the suggestions in the 'File/New' menu. Each of these is a smartphone app or a web service - the unbundling of productivity apps. And none of these have to be 'spreadsheets'. What also changes, of course, are our assumptions about what hardware, precisely, you need. Do you need a large or small screen, do you need a keyboard, a mouse or just touch, and do you need a complex multi-window OS (Windows, Mac OS) or a simpler model based on full-screen use (Windows 8 et al, iOS, Android)? If you have to make an Excel file, paste charts into PowerPoint and write bullets or a memo then yes, keyboards, mice and windowing make things much easier. But if you have to flag a few key changes on a dashboard and tag them for review by three colleagues, you might not. The business task being achieved might be the same. Again - you need a keyboard to do x, but is x actually your job, or it it just the tool you use today to do your job? What this points, to, I think, is that productivity breaks down into a set of verbs. In CC Baxter's office you see each of those verbs made into a physical object. Over time, those verbs get combined, broken apart, linked, created and removed as the tools change, the organization is changed by the tools and of course the underlying business itself changes. You don't actually send email or make a spreadsheet - you analyze, delegate, report, confer, decide, track and so on. Or, perhaps, 'what's going on, what are we doing and what should we be doing?' Each set of tools fixes that into a different pattern, but one should not look at that pattern and assume that that's the way things must be done - that that's what 'real work' looks like. A thread through all of this is communication, which prompted the slide below (created in PowerPoint, of course). Communication changes from a typed memo hand-carried to your desk in a manila internal mail envelope, to a carefully-laid-out presentation laboriously crafted in PowerPoint (maybe emailed, maybe presented on screen, maybe printed), to threads in Slack, a chat app with third-party service and data integrations. The real, underlying task is to communicate around the problem "how are sales of widgets going, why, and what should we do about it? ", and that might not have changed at all, though you might have gone from a week to a day to a minute to get the answer. Distilling that further, there is information and the creation and analysis of it, and then there is communication - the connective tissue of the organisation. Right now, both of these generally mean the creation and the passing around or talking through of document files. But there's nothing eternal about that model. Ironically, Lotus Notes, one of the earliest corporate messaging programs, was intended to be much more than email, calendaring and so on - there was a vision of a unified development environment, database and messaging system - 'groupware'. It didn't quite work out like that, and actually using Lotus Notes as I had to 15 years ago was rather like using an email client built with Microsoft Access - theoretically possible but not a very good idea. OLE in the 1990s was another concept that didn't quite work, embedding pieces of one program's document inside another. But today, Facebook's platform on the desktop is pretty much Ray Ozzie's vision built all over again but for consumers instead of enterprise and for cat pictures instead of sales forecasts - a combination of messaging with embedded applications and many different data types and views for different tasks. Hence, one could propose one future model as 'Facebook for the enterprise', but with the platform, not the social, being the point of the analogy. This is also what productivity concept videos, like this one from Microsoft, tend to look like. Somehow scifi interfaces never have multiple applications from different vendors with patchy cross-compatability. Rather, every different data type flows seamlessly between nodes and screens. Everything is structured data (no more typing numbers from a PDF into Excel) and everything is a message, or can be. This video is really showing Facebook, but for the enterprise and with lots of really thin sans-serifs. The challenge here is the trade off between breadth and flexibility on one hand and focus and single-purpose efficiency on the other. It's easy to make everything flow together in a single UI if you have a narrow domain, but much harder if you're trying to encompass lots of different tasks and types of data. Sometimes the right 'unified UI' is a dedicated app and sometimes it's Windows, or a web browser, aggregating lots of different apps with different UIs. But mostly, it's the email app itself that's the universal connector, linking documents, data and ideas. That is, 'Send' is the universal verb that ties the others together. There have been lots of experiments in this area besides Notes or Facebook - one could include Google's abortive Wave all the way back in 2010, Microsoft's Courier concept and now Microsoft's 'Gigjam' project. But a good place to see this now is to compare two productivity startups, Slack (previously mentioned) and Quip. Slack is a person-to-person messaging platform that's more than messaging - through third-party integrations, it acts as a common aggregation layer for every other system in an enterprise. All the messages, updates and notifications from the dozens of other systems in a company can be inserted into the relevant team or project chat channels, and then be scanned through or searched later on. Slack is effectively a networked file manager, but instead of folders full of Photoshop, Word or Excel files you have links to Google Docs, SAP or Salesforce, all surrounded by the relevant context and team conversation. Then, if Slack is messaging that adds software, Quip is the other way around - productivity software (tables, analysis, text, tasks and so on) with messaging as an integral part of the data model, rather than siloed into a separate app ('email this document'). What both are trying to do is blur the boundaries between 'messaging' and 'applications' such that the data all sits within the communication space - rather like that Microsoft concept video above. Much the same is happening in smartphone interfaces more generally, as I discussed here: the difference between messaging and apps is blurring. All of this recalls the old tech joke ('Zawinski's Law') that all software expands until it can read email, but now this works in both directions - messages become software, but software becomes messages. The whole ‘tablets and PCs’ discussion today reminds me a great deal of similar conversations we used to have a decade ago about ‘laptop or desktop’. That is, someone would ask a vaguely technical friend whether they should buy a laptop or a desktop. And the answer would be “well, how much money do you have and what do you want to do with it?” Laptops were portable but had smaller screens, less power and were more expensive. Which trade-off depended on how you planned to use it. Much the same analysis applies to tablets today - "what are you going to do with it?" Are you going to do sophisticated, complex, multi-app computing? Lots of keyboard work and detailed manipulation that a mouse is better for? Apps that are only ON a PC? Then get one (whether desktop or laptop). Mostly web, email, games, video, social networks and you’re walking around all the time? A tablet might suit you very well. You probably have a PC too - there’s very little actual substitution right now, but there is an impact on the PC replacement cycle (as well as expanding the pie massively, especially in emerging markets, which is another conversation). And of course this break point will move as well, just as the laptop/desktop break point did - tablets will get faster and more sophisticated and capable of substituting more tasks. And so we should expect to see tablets taking a growing chunk out of the PC market. Another very important lens to look at this through, though, is Microsoft Office. Office is extremely good (tautologically) at the things it’s good at - there is no credible alternative to Excel for making large financial models and no credible alternative to Powerpoint for making 150-page pitch books, for example. Free alternatives nibble around the edges, and specialised use cases such as statistics have been carved out long ago, but the real threats come from use cases where you shouldn’t really be using Office at all. This ‘shouldn’t use’ comes from both above and below. Someone said to me on Twitter (I now can’t find who) that their consulting business spent half its time telling people to stop using Excel and use a database and the other half telling people to to stop using a database and use Excel. That is, Excel is used as a business information system in a huge number of companies. It’s a powerful and flexible IDE on its own terms, and this is sometimes a good use, but it often isn’t, and specialized SAAS services will probably carve out an increasing number of these use cases. When I worked at Orange there was a multi-megabyte Excel file on the network drive called, I believe, ‘sum_of_x.xls’ containing complex macros and every major operating metric for the entire company, there for anyone who needed to analyze high-level data. That should probably not, really, be in Excel today. The same applies to Powerpoint - it’s a very good tool for that 150 slide deck, but what if you’re making a 10-slide deck each week that consists entirely of operating metrics pulled out of a back-end system, manipulated in Excel and pasted into slides, plus commentary, that are emailed to 25 people? Shouldn’t that change from a 2 hour task to a SAAS dashboard and a 30-second task? And would it still need a mouse and keyboard? This carving out comes from below, too. One of these is the Google Docs story, about there can be much debate, but to me the interesting challenge is embodied by this screenshot - the ‘new file’ menu in Excel. How many of these are actually smartphone or tablet apps providing custom lists or databases? Or Mint (another SAAS)? How many presentation templates might also be something like Storehouse? This is, of course, all about unbundling and specialisation. 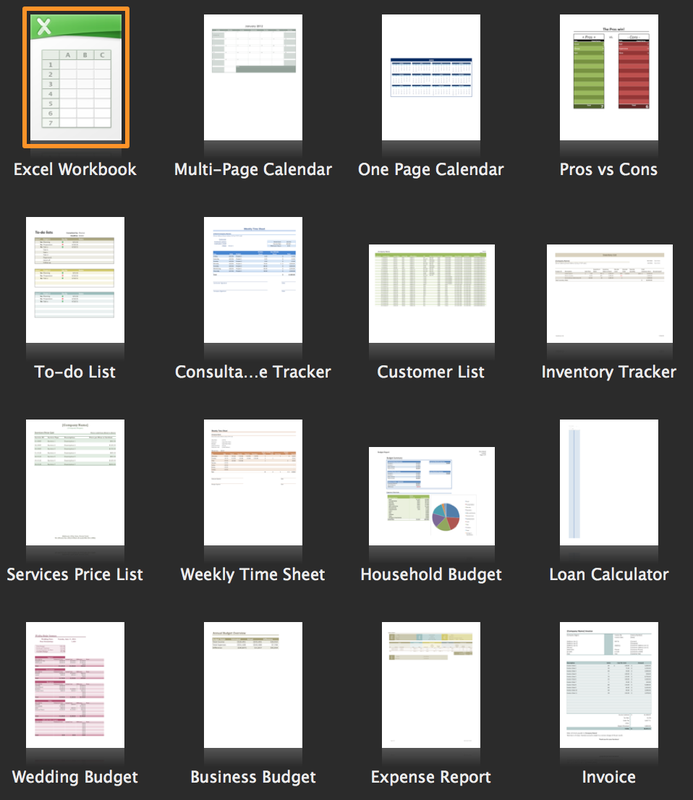 Office apps (generically) are very broad and deep and general purpose. Critics tend to focus on the depth and talk about how few people need all those features, but miss the breadth - of how many things a general purpose ‘table’ app or ‘make pages’ app can be used for (including what look to technical people like misuses - the classic example being the person who pastes a screenshot into a Word document and emails that). I'd suggest that a meaningful proportion of Excel use doesn't involve formulas, for example, just lists and tables and page layout - IDE as DTP. New routes to market and new interaction models provide new ways to challenge that hegemonic interaction model, just as smartphones allow the unbundling of Facebook's interaction models - SAAS changes Office and so do app stores. This brings us back to the mouse and keyboard that you ‘need for real work’, as the phrase goes. Yes, you really do need them to make a financial model. And you need them to make an operating metrics summary - in Excel and Powerpoint. But is that, really, what you need to be doing to achieve the underlying business purpose? Very few people's job is literally 'make Excel files'. And what if you spend the other 90% of your time on the road meeting clients and replying to emails? Do you need a laptop, or a tablet? Do you need a tablet as well as a smartphone? Or a laptop, or phablet? Or both? Well, what do you want do with it? it’s all just glass - the only real different is the size and the input mechanism that suits your task.